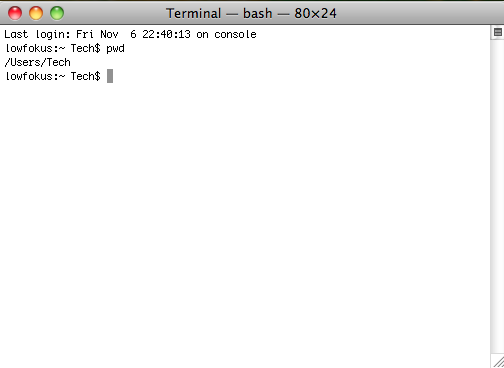 OS X Shell | Technology...and stuff. 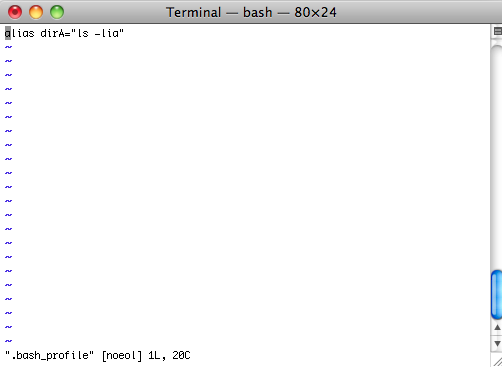 Here is a quick tutorial for people unfamiliar with text editors in UNIX. 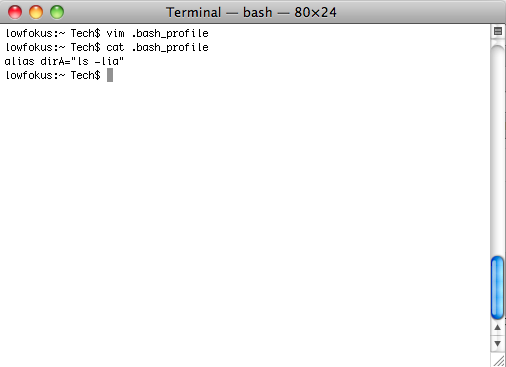 If you are just getting started with the Terminal in OS X, you probably need to create your .bash_profile and such, so that you can keep your settings upon logging out of the shell. 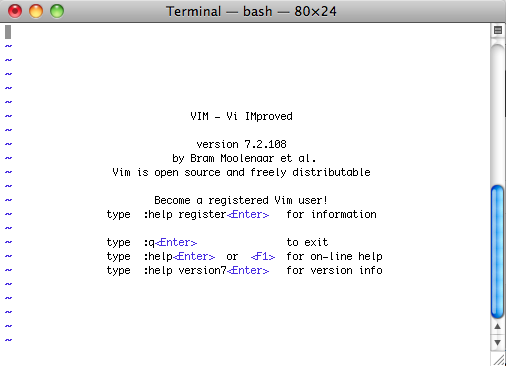 I will show you how to create this file in a text editor called vim, which stands for vi IMproved. Vim is a very powerful text editor, and if you have any experience in UNIX at all, you probably were shown pico, which is easier to use at first due to some of the commands being shown at the bottom of the screen as you work in pico’s buffer. In pico, there is no separation from command or input modes, also making it a bit less confusing. The buffer simply means what is shown on your screen, not yet written to disk. While a GUI text editor such as Microsoft Word or Apple’s Pages do not tell you that you are working in a buffer input mode, technically it is the same thing. If they crash, you lose what you changed if it was not saved prior to the crash. As shown in the screenshot (click to enlarge it, as with all screenshots on this blog), the buffer is in INSERT mode. 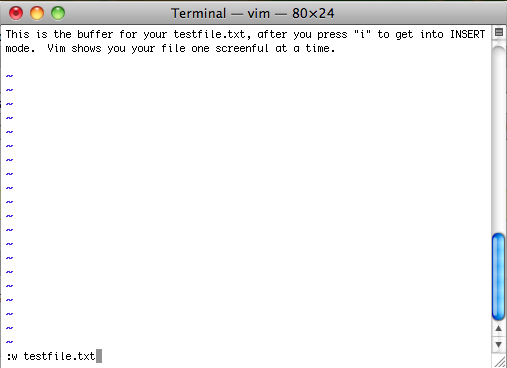 By default, no matter what file you open or create, vim starts in command mode. It doesn’t ever show —COMMAND— at the bottom of the screen. Vim lets you know you aren’t in command mode by telling you that you are in INSERT mode. 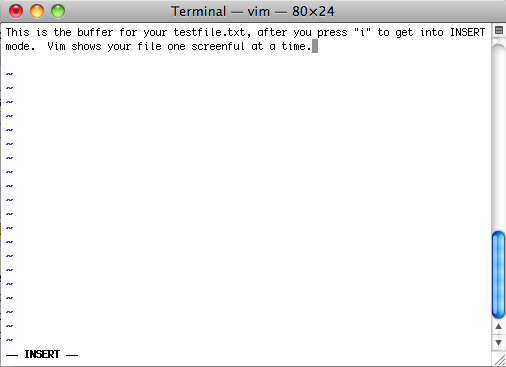 To get back into command mode, which is where you will end up saving files to disk, changing the contents of vim’s 26 named buffers (consider them like the clipboard in a GUI text editor), moving around the screen, deleting lines, etc. 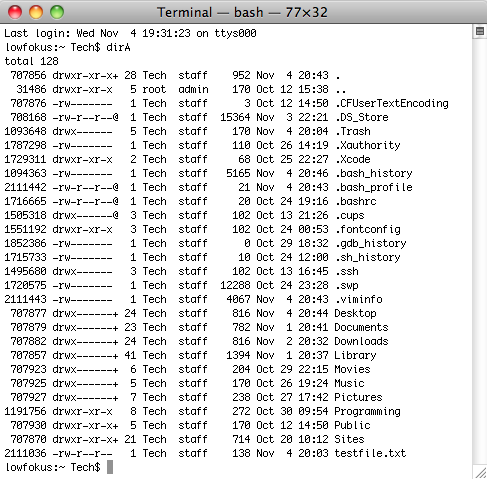 Anything you want to do with the file besides type in text will generally be done in command mode. Let’s save this file now, so you can see how it works to get in and out of command mode. 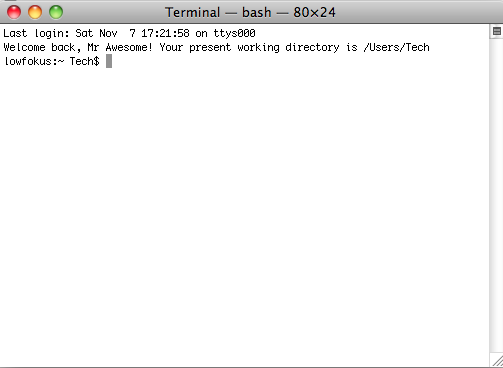 You can see at the bottom of the Terminal window that the write command was successful. You also see that three lines were written containing a total of 138 characters. You can verify the file was written by typing (again, without quotes) “:q“, and hit enter. This quits vim. 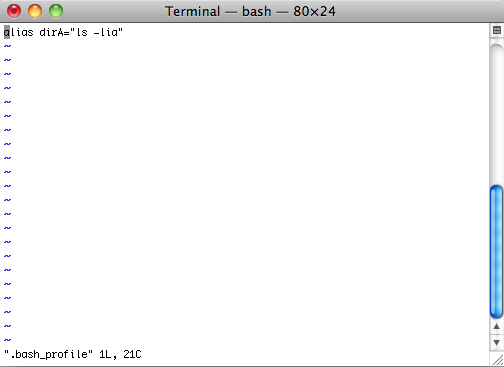 At the bash prompt, type “ls” and hit enter. You should see your new file in the list of the directory. 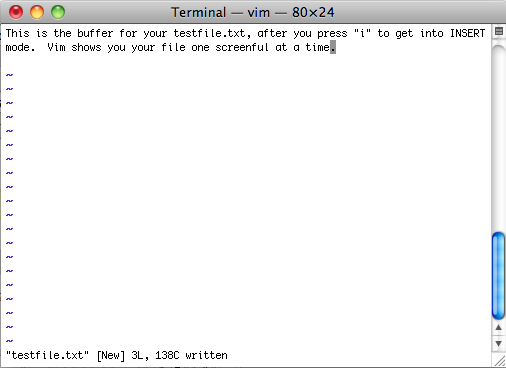 To remove (delete) the file, type “rm testfile.txt” and hit enter. 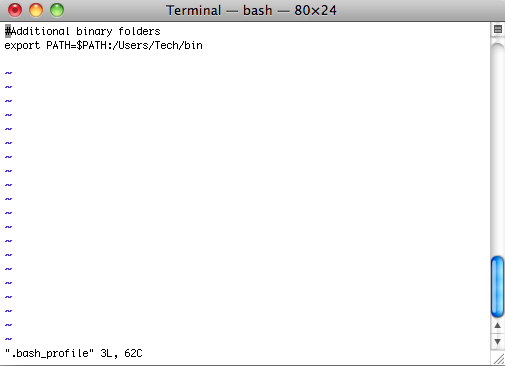 Now to create your .bash_profile, so you can save certain settings. When Terminal starts, it will read this file to load alias information, screen settings and such, if they are explained in this file. As you become more familiar with the Terminal and start to have preferences for certain things, i.e., showing hidden files when you get a list of a directory, you may want to create an alias for the ls command so it shows them by “default” because of your .bash_profile. 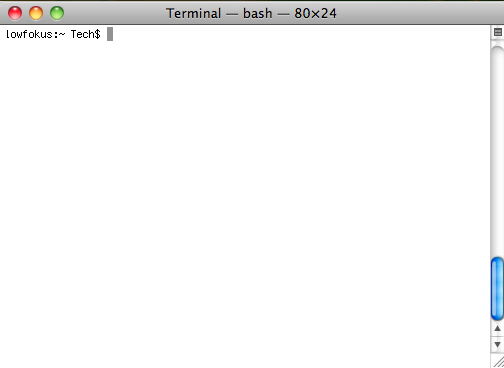 Create your empty .bash_profile by typing “vim .bash_profile” and hitting enter. We will create a simple alias and save the profile. Then we will quit Terminal, restart it and verify the alias still works. Next time I will show you how to navigate through text, delete lines and add or retrieve lines to and from the named buffers. If there are certain things you would like to learn about Terminal or vim, please leave comments below. Please also let me know if any of this could be better clarified, as I check my comments often and will respond promptly. Thanks for reading!